Lynyrd Skynyrd Guitar Riffs "Tuesday's Gone" - Free Lynyrd Skynyrd Guitar Riffs! This free Lynyrd Skynyrd guitar riff is "Tuesday's Gone". Another classic riff by Lynyrd Skynyrd that everyone knows. Notice the time signature on this riff is 12/8 and not your typical 4/4. If you want to learn more about time signatures check out the guitar for beginners page. 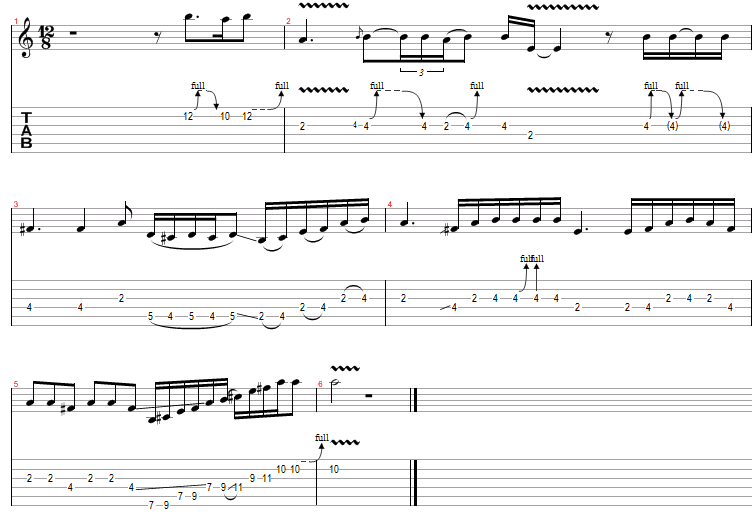 This riff uses alot of bends and hammer ons just like in so many other Lynryd Skynyrd guitar riffs. Start off slow and work your way to "Faster" which is the acutal speed of this riff. The solo to "Tuesday's Gone" by Lynyrd Skynyrd uses the A Minor Pentatonic Scale and a bunch of bends. They key to learning this riff is the timing of the notes. It can be tricky if you are used to playing only songs with 4/4 time signatures but you will get the hang of it if you start off slow and work your way up.